Yes, you will be giving your carpet and upholstery the very best clean when you use Lady Rene. You want your carpet and fabrics to look the very best it can then you should choose the steam cleaning experts. All Lady Rene technicians are professionally trained qualified and take pride in their cleaning. At Lady Rene, we respect your valuable belongings and take considerable care in moving you furniture. At Lady Rene we use only the very best in cleaning technology, offering you quality result and reassurance. You can enjoy not only great looking carpet but upholstery too. When Lady Rene has cleaned your Carpet and Upholstery we can also protect the area for optimum ongoing performance and stain resistance. ..."In our opinion, & all our testing bears this out, it's the only real cleaning system. Everything else is just an interim system, just rearranging the dirt. I hope someday the world will wake up & realise that". 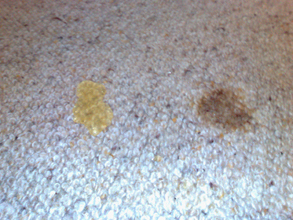 After having your carpet and upholstery steam cleaned. We highly recommend the application of a soil and stain protector. With Lady Rene’s use of only premium chemicals and solutions you can rest assure that you will be giving your carpet and fabrics the very best protection and stain resistance. Carpet and fabric protectors shield the fibres from abrasion and premature staining. They enable the easy cleaning of spots and spills. Most importantly they make your carpet and fabric more resistant to wear and thus lasting a lot longer. Our customers often remark on how they will never go without in the future. A sample we tested- same piece of carpet, with one part protected and one not. Lady Rene is a front runner in the cleaning industry. We find the solution for your cleaning requirements. For over 3 decades we have provided service and advice that enables our clients to maintain the appearance and health attributes of their business’ place of work at an optimum level and also without forgetting, most importantly at an affordable price. With Lady Rene’s purpose built industrial machinery and cleaning solutions that will knock out even the toughest cleaning problems, you can be assured that all of your cleaning requirements will be met and exceeded. Over the years of commercial cleaning we have developed an understanding of what our customers need, and often provide a service that is far more than what they ever thought was possible for the price we offer. With the experience of over 36 years on our side we know we can provide cleaning to your business to exceed even the fussiest client’s expectations. Call Lady Rene today for a quote on the best job you will ever see. With over 40 years experience in the industry, Lady Rene has the cleaning solution for you. Our extensive range of cleaners and spotters leave no stain untreated. We carry a spotter for every situation. With careful attention to detail our experience and product range will leave your carpet cleaner than you have ever seen before. Last month I had the pleasure of meeting Andrew who came to clean my carpet – every room (bar kitchen and bathroom) including stairs. Quickly and carefully, he moved furniture where appropriate and meticulously went about cleaning the carpet. I had pointed out various stains which I had attempted to take out myself (without success) and he did a superb job in removing these. I would have no hesitation in recommending Lady Rene to anyone who was looking for courteous, prompt, considerate attention and who wanted their carpets to look as new." 24 Hour Service. For issues caused by leaking showers, burst pipes, washing machines, over flow storm water and much more. When you call Lady Rene to attend to your emergency, we treat your job as the highest priority. Water Damage does not just affect the carpet and furniture, the building, skirtings and sub floor needs to be addressed also. In the case of a flooded carpet we respond quickly to ensure we can remove the free water and start the drying process as soon as possible. There is no job to large or small. You can have your outdoor areas pressure washed also. We maintain our great quality and service outside the home and business too. Using industrial cleaning machines we can return the life back into all your hard surface areas. We have sealers for all surfaces and finishes. including colour sealing. With Lady Rene you can have the confidence to know that your floor will be sealed with the very highest quality sealers and protectors. Whether you want only grout sealed or complete colour changes, we can assist and advise you on what products and processes would suit your situation best. With Lady Rene's "TILE AND GROUT CLEANING SYSTEM" your tiled floors will be cleaned to a standard that has never been reached before. Glazed or unglazed Ceramic, Porcelain, Travertine, Marble, Limestone, Terracotta, plus more. A new method of tile and grout cleaning, you must see it to believe it. High pressure steam cleaning of tile and grout is a specialty service that Lady Rene has offered for over 12 years. Lady Rene’s Tile and Grout cleaning is a unique system which captures all cleaning solution and soil leaving absolutely no residue behind. We use a combination of the right solutions and specialised cleaning equipment. Combined with Lady Rene’s extensive experience and research, we can tackle even the most stubborn floors and hard surfaces to bring them back to life and result in a back to new finish. You will be dealing with a company that has over 35 years experience and is continually devoted to researching and supplying you with specialty cleaning solutions to provide you with unsurpassed cleaning results.